What is a Stock Spam Report? Stock spam has been around as long as the e-mail and the Web, but it has gotten much worse in the last few years. Stock spam messages rose 120% in the last six months, according to data from Postini, a messaging security company. In total, stock-related messages make up about 20% of all spam landing in in-boxes. The SEC estimates that 100 million stock spam messages are sent each week. The SEC's move to suspend trading on the 35 stocks is overdue, according to security experts. "People in the technology industry have been impatient to see some action from the SEC," says Patrick Peterson, vice president of technology at e-mail security company Ironport. The SEC's anti-spam team "Operation Spamalot", identified 35 stocks that had seen their shares rise after spam campaigns, according to Linda Chatman Thomsen, director of the SEC's Enforcement Division. Stock spam is simply a high-tech version of the classic stock market scam called the pump and dump scheme: Promoters send millions of e-mail messages at a time promoting "can't miss" stock tips. Enough recipients inexplicably buy in, the price soars and then the spammers sell off their shares at the top of bubble. Qwoter's Spam Report is tracking approximately 1,500+ public company’s daily and while the Securities and Exchange Commission made a splash by unveiling "Operation Spamalot", it is unlikely to end spam. In the face of increased enforcement, warnings and federal laws, spam is not only continuing, but flourishing. And there's no reason to think the SEC will be able to do anything to stop it. What is Included in a Spam Report? We took a public company that was a heavily promoted stock and tracked through our Spam Report, then compared the spam amounts to the share price and stock volume. You can clearly see the ratio among the spam messages sent, stock price and volume. The 'promoters' are given or buy the stock at low prices - usually lower then market value. The 'promoters' send out their stock spam emails messages about this "can't miss stock". Victims of the email spam buy shares, which artificially pumps up the stock price up by more then 150%! 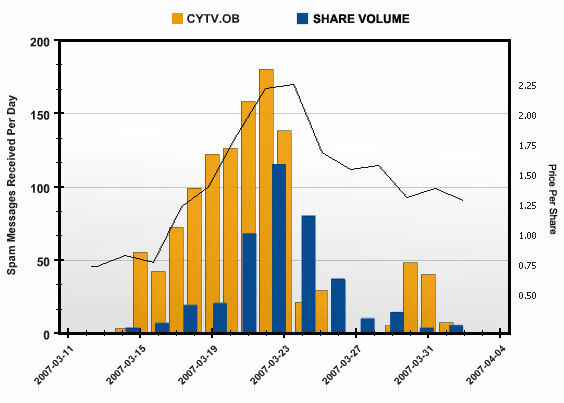 At the peak of the stock price, the 'promoters' dump and sell their stock - which is shown by the increase in volume. As shares are sold, the stock price decreases and re-adjusts - often times lower then what the price was before the spam started. Investors are forced to sell at a loss or hold onto a losing stock in their portfolio. How can you protect yourself from investing in a spammed stock? Unless you can buy in at the right time! Why is a Spam Report Useful & How Can it Help an Investor? As a stock gets promoted through spam, it can lead to short-term increases in a company's share price. However, this artificial price is usually followed by a sharp fall as the spammers sell their positions at the higher prices to make money (as outlined in the example above). This can be very damaging to the company - as well as to the investor in the company. If you are active in the market, be careful and don't believe what you get in your email box. If someone is pumping stocks, chances are they're doing so for their own, personal gain - not yours. Always rely on known, secure sources for your information - or rely on a reliable brokerage firm. By utilizing the same thought process of stock spammers, you will now know (with Qwoter Stock Spam Tracker) when promoters are sending millions of e-mail messages at a time promoting their "can't miss" stock tips. When enough recipients inexplicably buy in, the price soars and then (YOU) the investor can sell off their shares at the top of bubble - not at the bottom after the spammers make their money off of you. If you are active in the market, be careful and don't believe what you get in your email box. If someone is pumping stocks, chances are they're doing so for their own, personal gain -- not yours. Always rely on known, secure sources for your information -- or rely on a reliable brokerage firm. The common investor will now have an information tool in which to make a more informed investment decision, whether the investor chooses to catch the wave early or to stay away from a "too good to be true" stock scam, at least he or she will have a better map of the terrain surrounding their investment decision. View the latest Stock Spam from our Spam Report. * This page does not constitute financial advice about any public company. The Spam Report is simply a record of the promotion of a company's stock by means of unsolicited commercial email. Please note that we do not send stock spam and that stock spams are most often sent by third parties trying to manipulate the company's stock, the company is typically not responsible for the spam. Every effort is made to ensure that the information on the Spam Report is accurate. If you represent a listed company and you feel that an entry is incorrect in any way, please contact us.